"Welcome to the Official Website of author Julie Harrington." You can visit Julie on her social media pages via the links on the “Follow Me” tab hovering on the left side of your screen. 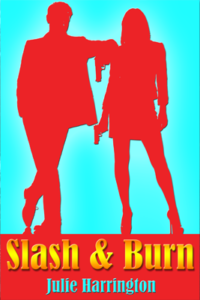 Slash & Burn is now available! Passion tore John Stark and Sara Keegan apart. Murder reunites them. Tomorrow might be their second chance —if they can stay alive that long. 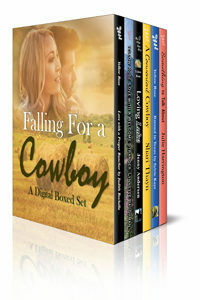 Also, The Wild Rose Press’ new digital boxed set “Falling For A Cowboy,” which includes my novel Something To Talk About, is now available! This boxed set is a limited time offer and available on Amazon starting November 2, 2017. After that, it’s only available for a short, so be sure to grab your copy while you can. It’s a great offer–6 authors, 6 books, all for $2.99. Also, please take some time to explore the site so you don’t miss the special extras tucked here and there like short stories and soundtracks that inspired me while writing, then visit me on my social media like Twitter and Facebook. If there’s something you’d like to see included on the site, don’t be shy! Rate & review my books on your favorite book sites (always super appreciated) and feel free to drop me a line via email or the Contact page. Thanks! Click a Cover for More Info.